The next step forward in emissions monitoring is already here - at AMP-Cherokee. Our integrated CEMS / PEMS Hybrid systems feature the DAS ProLogix software and an HMI interface. Monitor multiple sources through CEMS and/or PEMS systems via DAS ProLogix for analysis and reporting. As a fully integrated emissions monitoring solution, AMP-Cherokee has integrated data collection, analysis and reporting of its CEMS and PEMS technologies under the DAS ProLogix™ software platform. AMP-Cherokee is the only CEMS integrator that currently offers a CEMS DAS and PEMS using the same integrated software package, DAS ProLogix ™. With DAS ProLogix™, data redundancy is provided at the PLC and polling computer prior to distribution to Ethernet/IP-based networks. Any data transfers that are interrupted by network disconnections are automatically restored to all servers. One scenario is for customers to start off with a traditional CEMS and then later switch over to a PEMS, thereby saving 40 to 60% in operating costs. Customers can typically obtain approval for switching to a PEMS by simply submitting an Alternative Monitoring Plan to their regulatory agency. After switching over to the PEMS, the CEMS can still be used as for back-up emissions monitoring. AMP-Cherokee’s PEMS ProLogix™, is a PLC-based emissions monitoring and reporting software for sources qualifying under 40 CFR 60 Appendix B (boilers) and 40 CFR Part 75 Subpart E. AMP-Cherokee is one of just a few CEMS integrators that currently offers our own Data Acquisition System (DAS) software, PEMS ProLogix™. PEMS ProLogix™ calculates criteria pollutant emissions with CEMS-level accuracy, thereby lowering operating costs and increasing reliability. Deliver real time results over your Ethernet/IP networks for the highest system visibility available. Our open architecture PEMS ProLogix™ data acquisition and reporting software, through its HMI>Network Interface™ and Allen-Bradley® PLC platform, provides network connectivity and remote operation. PEMS ProLogix™ combines its comprehensive dialogue screens and monitoring analysis tools into an easy to use interface. PEMS ProLogix™ offers all the monitoring capability needed to perform accurate data collection and real-time analysis. PEMS ProLogix™ runs efficiently providing constant visibility via real-time data, trending and customizable reporting. One of the unique features of PEMS PEMS ProLogix™ is its programming flexibility. PEMS ProLogix™ is a full-featured, predictive emissions monitoring software for qualified sources under the EPA PS-16 audit standards for compliance with 40 CFR Part 75 Subpart E and 40 CFR Part 60 Appendix B regulations for monitoring nitrogen oxides and oxygen at industrial sources. PEMS PEMS ProLogix™ uses a statistical hybrid model to provide real-time emissions predictions from a wide range of operating input parameters with CEMS-level accuracy and reliability. PEMS ProLogix™ has customizable real time and historical display graphs to allow monitoring of emissions and process parameters. The PEMS ProLogix™ Reporting Suite provides Part 60 compliant reporting, including daily calibrations, emissions reporting, and rolling averages. PEMS ProLogix™ controls operations and monitors system health status. User-configurable email alarms - critical and noncritical - can be configured across your monitoring network. Remote access provides administration level operation controls and troubleshooting tools to locate PEMS faults. 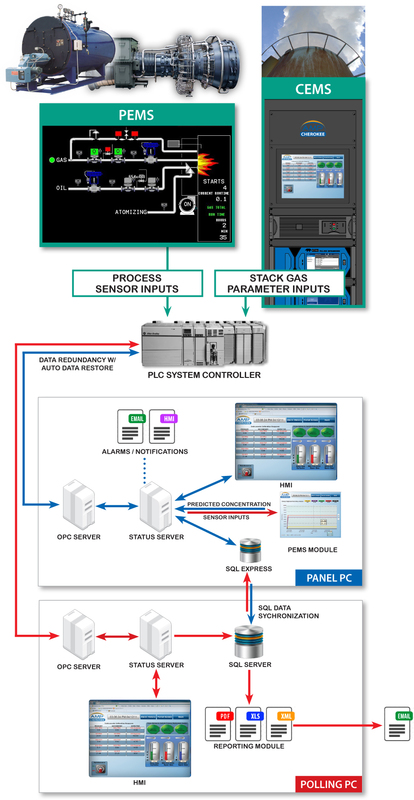 From source data collected during process characterization, the PEMS ProLogix™ provides dynamic process sensor validation and error correction, along with data acquisition functions such as startup, shutdown, and other historical events.